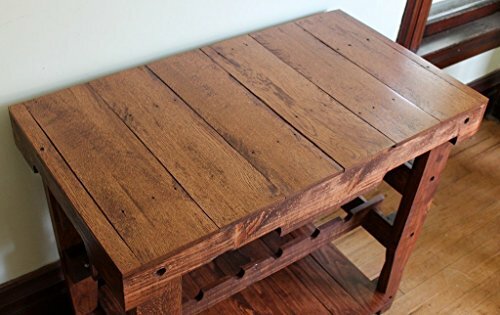 Beautify your dining or living area with this buffet table made from reclaimed pallet wood. With two wine rack shelves and an additional bottom shelf, this piece has plenty of storage and versatility. Wine racks hold a total of 10 wine bottles, 5 per shelf. The table pictured is stained in a beautiful English Chestnut, but can be stained or painted in whatever color you prefer. The table is sealed with an acrylic sealer to give it a nice shine and protect the wood for years to come. This table measures approximately 35" long x 19" deep x 30" tall. GOOD TO KNOW: Reclaimed wood varies in color, density and texture. Handmade items may have slight flaws or imperfections due to the type of materials used (this includes nail holes, knot holes, and minor surface flaws like dings and dents). This item takes approximately 4 weeks to create. We always provide photos to buyers to make sure you are completely satisfied with the final product before shipping. ASSEMBLY REQUIRED: Table ships flat in a disassembled state. Lag bolts, washers, and nuts are included for attaching each leg to the base, shelves, and table top. Tools required for assembly: pliers and a socket wrench. SHIPPING INFORMATION: Item ships FedEx Ground.